Seeing as they're one of my all-time favorite bands, surely I must've seen Blur live, right? The answer is yes, although sadly to this day the concert I'm about to write up for this post is the one and only time and it was almost thirteen years ago. Since that 2003 tour, they've toured in 2009, 2012, 2013, 2014, and 2015; however, in those years they've only played *FOUR* concerts in the US...two at Coachella in 2013, one in Los Angeles, and one in New York City (both in 2015). With a wife, four kids, a house, and a full-time job, none of those shows were near enough to be convenient or feasible, so until (or if ever) Blur decide to do another proper tour of America, the 2003 show I saw will be the only time I'll have seen them. But oh, what a great show it was, even though it was during the period when Graham Coxon was estranged from the band. In the spring of 1999, I was finishing my sophomore year at university. The 13 album and the "Tender" single had been released and both of them blew my mind. When I heard that Blur would be playing a show in New York City showcasing the entire 13 album at the end of March, I just had to go. It was a ~4-5 hour drive to New York City and I was all set to go, I had tickets lined up and a way to get there, but at the last minute I decided not to go. I had some tough exams coming up and needed to study for them. I remember thinking to myself "I'll just go see them later this year when they come back to the US" which, of course, they never did. They only played three shows in the US/North America that year: the one in NYC, one in Toronto, and one in Los Angeles, and then spent the rest of the year touring Europe, South America, and Asia. Graham left the band during the recording of the Think Tank album in 2002 and so it seemed I'd missed my chance to ever see Blur in concert. Fast forward to 2003 and they announced a world tour to start in March and then released Think Tank in May. As soon as the tour itinerary was released and I saw they had a show scheduled in Boston I knew I had to go. I ordered two tickets, one for me and one for my brother, well in advance of the show (which was in July) and thought everything would be fine. However, I began to panic as they hadn't shown up and the show was only a week away! I made a few calls to the ticket agency (Next Ticketing) and they assured me the tickets had been sent. 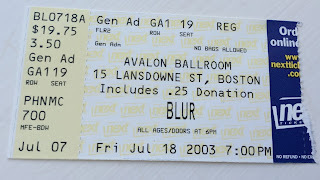 I couldn't believe it...here was my chance to finally see Blur, my credit card had been charged and the tickets sent, but now it looked like they were lost in the mail and I'd miss out on seeing them again! It wasn't until three days before the show that they finally arrived in the mail and what a relief that was! Standing at the front of the stage, the view was great and we got to shake Damon's hands a few times as he came by. He did his usual spraying of water from bottles and we got soaked and the few times he jumped into the crowd, we held him up and pushed him back up onto the stage. Damon was wearing a sportcoat over his usual Fred Perry shirt to start the show, but he soaked through it quickly as the atmosphere inside was stifling and he took it off after only a few songs. The show itself was fantastic, starting with "Ambulance" which I've always thought was a great opener, and progressing through a long set filled with most of the new album as well as a lot of older cuts. The coolest thing about the show was it was the first time on the 2003 tour they played "The Universal" and one of the first times on the tour that they played "To the End." There was an audience vote for whether they should play "Sweet Song" or "Good Song" based on the amount of applause each song got...Damon was the judge and as you can see above, "Good Song" won. Dave went absolutely nuts on the drums during the extended jam at the ends of both "On the Way to the Club" and "Trimm Trabb," both of which were typical for the 2003 tour and real highlights. When they came back onstage for the encores, they were hanging around at the front of the stage before they began and we got to chat with Alex for a minute before they started back up (he was having a cup of tea, complete with saucer, with his bass slung over his shoulder!). They ended the entire thing with an epic "This is a Low" which was only marred by their touring guitarist Simon Tong delivering a weak approximation of Graham's iconic solo. Overall, Tong did a passable job but he was certainly the weak link of the 2003 tour which is a shame as in his other bands and projects he's much better. After the show, while we were milling around to leave I ended up speaking to a fellow who had been next to us during the show. He was originally from the UK and was there with his wife...turns out he was a lighting tech on their 1995 UK tour and had seen them loads of times. He said this was one of the best shows he'd ever seen them do. By the time we exited to the street we were all very hot and soaked with sweat and walking out into the muggy summer night back to get back to the subway wasn't fun. That being said, it was honestly the best concert I've ever been to up to that point and to this day is one of the best I've ever seen...I still remember it fondly. My brother and I actually gotten invited to the afterparty at the Paradise but as it was getting late and we both had class the next day, we skipped it...a decision I regret to this day. I was lucky enough a few months later to get a recording of the concert on CD and every time I've listened to it over the years it takes me right back to that night. I had forgotten that Damon said something disparaging onstage about the now-defunct legendary Boston radio station WBCN because Blur had been scheduled to play their annual River Rave festival in Foxborough before it was cancelled. I can even hear myself cheering and yelling loudly on the recording (I must have been very close to the taper) including my loud "yeah!" when they started "Beetlebum" as the second song. I still hold out faint hope of seeing them again, especially since Graham has been back in the band since 2008, but until that day, this one and only time I've seen Blur live remains one of my sweetest concert memories. Good to connect with you on #blogchat tonight! I am not familiar with Blur, but I will check them out on Apple Music. I look forward to following your blog! Hi John! I hope you like them...very original and always changing...in so many ways, they are to the 1990s what the Beatles were to the 1960s, at least musically (Blur, for some weird reason, are massively popular everywhere except America, where they remain a cult act, albeit one with a huge and rabid following). I'd be happy to offer good suggestions for where to start with them if you'd like?